A Stalker drone flown by the U.S. military could get its battery recharged by laser power wirelessly. A silent drone flown by U.S. Special Forces could stay in the air forever, in theory, if power were being beamed to it from a laser on the ground. That exciting possibility came up during an indoor flight test showing how a laser could power a Stalker drone for 48 hours. The electric version of Lockheed Martin's Stalker has a battery that usually lasts just two hours, but in the test, a laser power system wirelessly recharged a drone battery in midair for 24 times as long. Such a system, if proven in actual outdoor flights, could give U.S. Special Forces a steady robot friend in the sky to watch for targets or approaching enemies. "This test is one of the final steps in bringing laser-powered flight to the field," said Tom Nugent, president of LaserMotive, which made the laser power system used in the test. "By enabling in-flight recharging, this system will ultimately extend capabilities, improve endurance and enable new missions for electric aircraft." LaserMotive previously made its mark by winning NASA's space elevator contest — a challenge to build machines powered by laser beams that can climb a cable toward the sky. The drone flight test took place in a wind tunnel to simulate flying conditions. By the end of the test, the Stalker's battery actually held more stored energy than it did at the beginning. "We're pleased with the results of this test," said Tom Koonce, the Stalker program manager of Lockheed Martin Skunk Works. "Laser power holds real promise in extending the capabilities of Stalker." 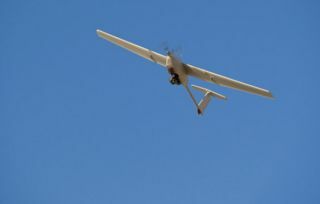 A next step for the Stalker involves testing the laser power technology during an outdoors flight. Laser power may work very well for electric drones the size of the Stalker, which has a 10-foot (3 meters) wingspan, but bigger electric aircraft have turned to different solutions for their higher power requirements. A planned trans-Atlantic flight of an electric aircraft will use drones to deliver fresh batteries in midair. This story was provided by InnovationNewsDaily, sister site to SPACE.com. Follow InnovationNewsDaily on Twitter @News_Innovation, or on Facebook.